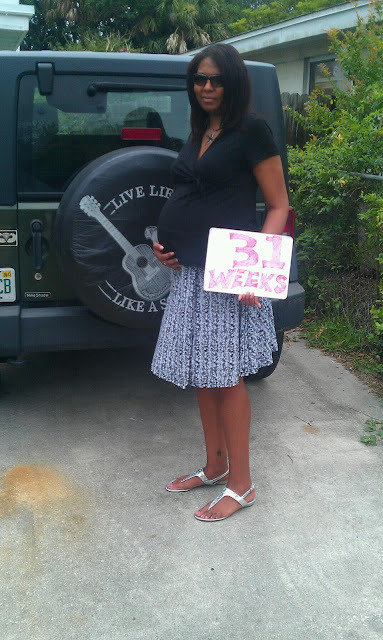 31 weeks and five days today, each week is a milestone. I am having some panic attacks at the thought that they will be here and 3 to 6 weeks and I don't think we're ready. Michael has time off this week so the nursery should be finished by the end of the week. My mom has been working on washing all their clothes, it makes me sad that I can't do it myself. I do have the cloth diapers to prep so I guess that makes up for it . I really do hate being on bed rest . According to thebump.com the twinjas should be about the size of pineapples, I don't think they're quite that big though. They probably weigh about 3 pounds but I found out today they are overachievers. Baby Girl is 4.5 pounds and Baby Boy is 4.2 pounds. They should be heading into a growth spurt . They can turn their heads from side to side and they're starting to plump out some more. They're moving a lot more now and that is very exciting, even if their favorite time to move is 2 o'clock in the morning. As for me I haven't noticed any Braxton Hicks contractions yet . I do have trouble breathing but that's probably due to my uterus pushing up against my lungs. I've started my at home hypnobabies course, but I do need to spend more time focusing on that. I am still hoping for a natural childbirth without drugs even though Michael thinks I'm crazy. This week I'm going to work on getting my hospital bag packed . I've settled on a pediatrician and I'm excited about that. The office is just a few blocks from our house, and she is a mother of twins too . Maternity Clothes? Yes, though I am starting to outgrow some of my maternity shorts and skirts. The dresses still work though. Stretch Marks? A few on my hips. Sleep? Sleeping on my sides makes my hips hurt, so I wake up every hour or so to switch sides, of course switching sides is not as easy as it sounds. Food Craving? Nothing specific this week. Gender prediction? One of each. I was right! Symptoms? Shortness of breath, itchy stomach (not scratching though), heart palpitations, fatigue and strangely the hair on my legs stopped growing. Belly Button in or out? Starting to pop out a little. Looking forward to? Finishing the nursery.